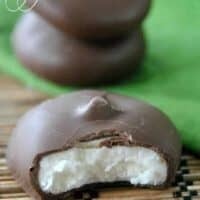 Homemade Peppermint Patties. 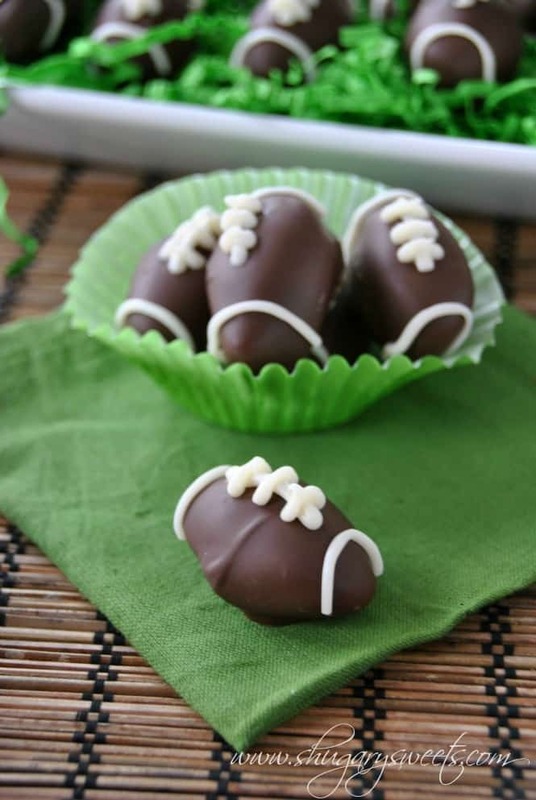 Not just any Peppermint patties either…how about if I made them in the shape of footballs? Apparently there is a big game this weekend? Yeah, I wouldn’t know much about it. I will be at a swim meet. Seriously. Some genius decided Superbowl weekend is the perfect weekend for a swim meet. We will be there from morning until around 9pm. Jealous? Don’t worry about me, and my whining. I’ve made up for not being able to go to a Superbowl party. I’ve been creating treats and snacks ALL WEEK. I’ve enjoyed my fair share of guacamole, chips and salsa, Reese’s Dip and more! 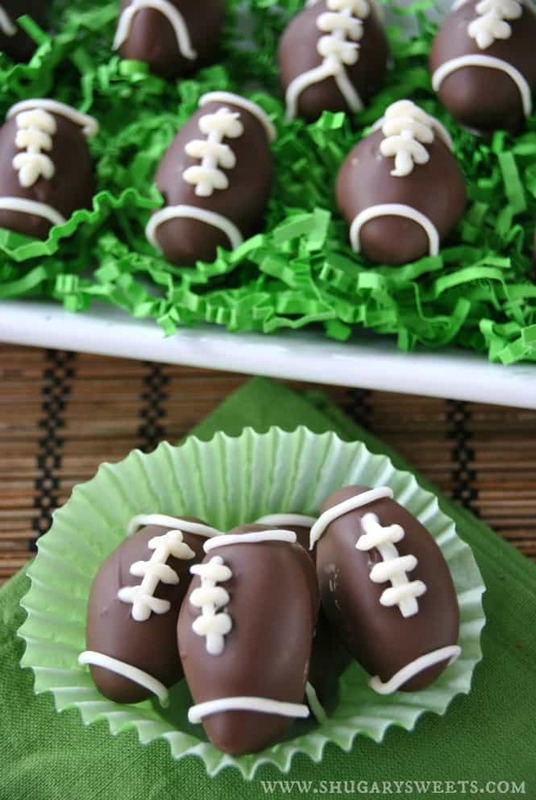 And these little football truffles? Yeah, they’re almost gone too! Shhhh, don’t tell, but I saved a few for the swim coaches, to thank them for all their time (I’m sure some of them would rather be sitting in front of a TV eating nachos)! But, back to the Peppermint patties. I found this recipe to make homemade patties on Tasty Kitchen. I slightly altered some of the ingredient amounts, and changed the preparation instructions to cut out some time for you. Originally the recipe said to make the filling. Chill it for a few hours. Then shape it and chill again for a few hours. I skipped that first chilling step with NO problems. The inside of these candies are so soft, I would say the exact texture of a peppermint patty! And who wouldn’t love to see a plate of these on the dessert table this weekend? Perfect to give you fresh breath after salsa, nachos and pizza! In a large mixing bowl, beat cream, butter, and extracts until fully combined. Add in powdered sugar and mix on medium speed until well blended (may take a couple minutes for it to come together). Line a large baking sheet with parchment paper. Using about 1 Tbsp of filling, shape into a ball, then flatten it for the traditional shape. If wanting to make footballs, shape into a ball and then pinch the ends. Continue until all filling is used. Cover with saran wrap and freeze for about 2 hours (or overnight). Melt chocolate Candiquik according to package directions. Using a toothpick, dip frozen peppermints into the chocolate. Tap until all the excess has dripped off and place back on the parchment paper. Repeat until all peppermints have been coated. These should be set within minutes, because you are doing them while still cold. Store at room temperature in a covered container! If making footballs, melt vanilla Candiquik according to package directions. Pour into a small ziploc bag and cut the corner off. Pipe laces onto footballs. Sets within minutes! ENJOY! These are adorable! 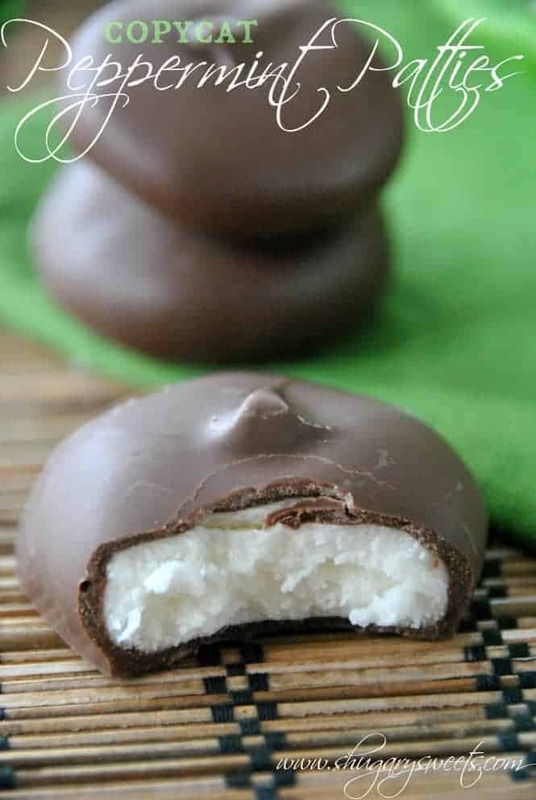 I just had a peppermint patty for lunch today and would love to start making these on my own. Thank you for the recipe and inspiration! You’re welcome Eva! I love sharing copycat recipes, I hope you try this one! Funny, I just made some peppermint patties yesterday…but the football ones are so cute! How fun Carolyn, was your recipe similar??? Not in the least, since mine was sugar-free. But same general idea! Still, love the football idea, that’s fantastic. 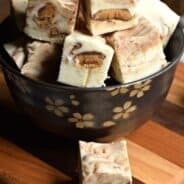 would love to have your sugar free recipe! Thanks Regina. I wanted to do a football truffle this year, these turned out perfect! They look phenomenal and so beautiful! You have the steadiest hands to work with these little things! Such a great job on these! Thanks Averie. I can keep my hand steady for something small like this. But ask me to do a wedding cake and I’m out of my element. Totally not my deal!! These are so cute!!! I LOVE peppermint patties! I love these! Peppermint Patties are one of my favorite candies. I am making something with peppermint this weekend, but now I want to just make these! Oooh, whatcha makin?? I love peppermint. How cute are these?! They would liven up any football spread. Thanks Nicole, I think so too! Good lord, do I love a peppermint pattie. This could be….dangerous. I tried to make some homemade peppermint patties last year (a different recipe) and they didn’t turn out so great. Your recipe sounds much better and your picture is amazing! Thanks Jenn. They honestly taste JUST like a York. No joke. Dang girl you are quick! So glad you are enjoying them, thanks for stopping back over here and letting me know, Glory! You have no idea how happy I am to see this (and that I have all the ingredients needed)! This is my husband’s favorite candy and he will be thrilled when I surprised him tomorrow afternoon with them! Thank you! Let me know how it turns out!! Can’t wait to hear how thrilled he was about this! ENJOY. Oh, the Niners are playing 🙂 Hehe, I seriously would have no clue. Or what their colors are!!! I am IN LOVE. That is all. I think one day I may look back and say I miss it too. We have all made some great friendships through swimming! pinch me. 🙂 I must be dreaming. You jsut made my very favorite chocolate candy at home Aimee!! I am LOVING this and can’t wait to try them out for myself. I seriously LOVE peppermint patties and the footballs? How incredibly adorable! Thanks Sally! I hope you try them and let me know how they compare to a York! I think it’s pretty close, except maybe dipping them in dark chocolate instead of chocolate coating! I make these all the time and everyone loves them. I make mine with condensed milk and pepermint oil. I also use the wilton pepermint flavored candy melts. i am interested to try this recipe to see how different it tastes. whaaa!? You’re crazy! This is awesome! Aimee, these are the cutest!!! Love love!!! That’s just wrong! Don’t the dads want to watch the game? Or do they stick the moms with meet duty? LOVE the peppermint patty footballs. OMG so cute! Definitely more mom’s will be there Sunday than dads. And the dad’s will be sitting in the gym with their mobile devices and laptops, haha!!! I can’t wait to try these! My favorite dessert, and I’ve always wondered about making them myself. Heya, I found you via Tidy Mom. These are too cute! I love the footballs! My boyfriend made a vegan version of peppermint patties for me with confectioners sugar, brown rice syrup, and semi-sweet dark chocolate chips. 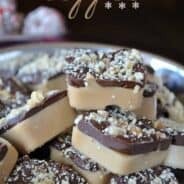 Homemade candy is the best! Homemade candy is the best 🙂 Totally agree! Glad you popped over! Oh YUM!!! I have a bag of slightly stale marshmallows…wonder if/how they would work. I’m not sure, to be honest. You would need to melt them down, but once melted they aren’t the exact consistency of marshmallow cream. Maybe add some corn syrup? Let me know what you try!! I have such a major weakness for peppermint patties! These look absolutely wonderful, Aimee! Aimee your have out done yourself this time! My kiddies will love these, putting on my to bake list! Thanks for sharing! These look amazing and oh so adorable! I am in love with your blog and all your tasty treats. So darn cute! And delicious…. OMG I don’t even like Peppermint Patties and I want to eat these. They are adorable! I’m so sorry you can’t enjoy the Superbowl; though really all your missing is a bunch of yelling at the TV. 😉 At least in my house anyways. Oh and maybe some chili, but you could have that any old time. Haha you crack me up! You can do any filling if you like, maybe the easy oreo truffle or a buckeye filling? these are too cute! what a great recipe for the big game! I want these so much. One of my fav treats. And how cute are those footballs?! I could eat a dozen of these! Beautiful! thanks Robyn, no worries, I ate your share! 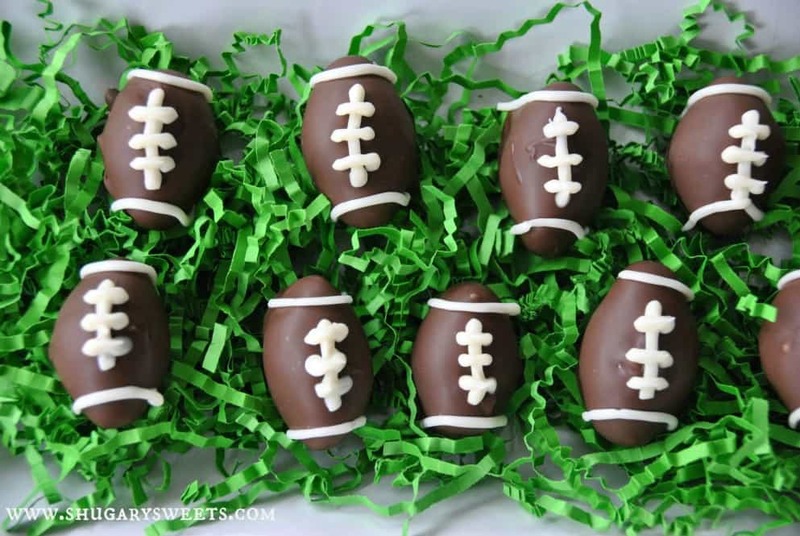 Totally love these as little footballs – almost too cute to eat!! Peppermint patties are a favorite in our hose. I really want to make them ourselves! Thanks Ginger!! I had fun making them too! Oh, WOW, Yum. Seriously, York Peppermint Patties are the only candy bar I cannot pass up. And now I can make my own. Maybe that isn’t a good thing because I’m the only one in my family that like chocolate with mint, but I’m going to make them anyway. Thanks for sharing. I found you at the What’s Cookin’ Wednesday link party. Have a great day. It can be good and bad, I completely agree!! So glad you stopped over! Just adorable and unique! So creative!! And I love peppermint! Of all the candies- peppermint patties are my favorite- how didn’t I know until now that they are so easy to make- and those footballs are to die for cute. I will bookmark them for football season!! I love these! Was just wondering if I could substitute raspberry extract for the peppermint. I was going to make a batch of each for those that don’t care for peppermint. I was considering making easter eggs from them…bet it would beat cadbury’s candy eggs. Using vanilla candiquick on the outside as well..and use festive pastel colors to decorate an egg shapped patty. Something to ponder..
Oooo, these look delicious! 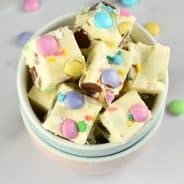 I’m thinking that I’ll have to try using melted semi-sweet chocolate chips instead of the candy coating since I haven’t been able to find peanut-free candy coating so far. Semi sweet will work just fine, or a dark chocolate works too! Sorry I just updated the recipe! I used to refrigerate and then dip them. But I found freezing them for 2 hours works best. The chocolate coating hardens quicker and the patty (or football) stays in shape!! ENJOY! Can these be made into truffles for gifts? I am from Australia and just wanted to know if you can purchase marshmallow cream and Candyquik ( I have no idea what that is) here in Australia or something similar. Peppermint patties are among my favorite candies. I look forward to trying this recipe. Making them into footballs is such a cute idea! I love the recipe! These little delights are a wonderful idea! What is the calorie intake and nutritional info? This looks wonderful.I did it, its delicious. Thanks for share this recipe. my son is rugby fan. i will make this for him. Thank you aimee!